The Agora Park and Showroom, part of the urban-scale project by the international developer HB Reavis, was ranked first among the 35 nominees and won the Community Space of the Year award in a close competition. 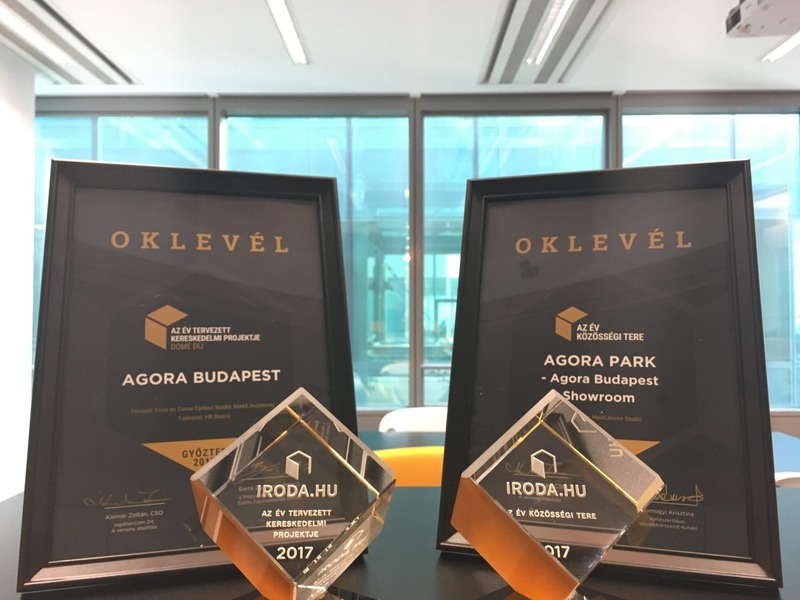 A jury of independent professionals also awarded the title of Planned Project of the Year – Commercial to Agora Budapest which means HB Reavis was ranked first in two categories in this property market competition. On the evening of 8 February, the Office of the Year 2017 awards were presented at a ceremony in the Castle Bazaar. In the Community Space of the Year category, the jury considered community spaces that are creative and special from an architectural viewpoint and those that provide a unique or innovative venue for enjoying quality relationships and leisure time. The 5,000 sq m public park by HB Reavis with a unique container-showroom at its centre is one of a kind and something that has never before been seen in Hungary. 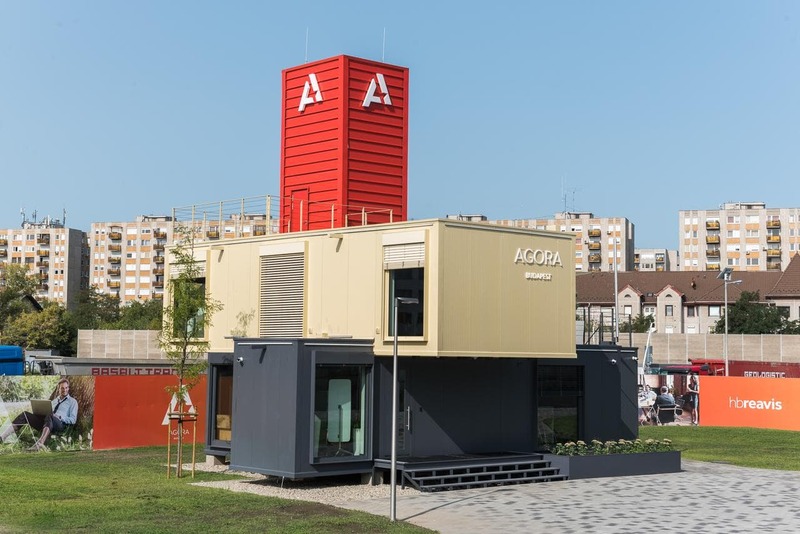 The high-tech showroom, made from 6 previously used shipping containers, provides an exclusive way directly at the construction site to show future tenants how their new offices are being built in the new city centre, Agora Budapest. The building, which was built in 3 months, was designed by MádiLáncos Stúdió, and the custom-made furniture was provided by Kinnarps. The developer recently invited the public to the showroom for an open day, and there are plans to have these kinds of days regularly in the future. It is also highly unusual for a property developer in Hungary to create a public park for the local community during the construction period, but HB Reavis chose to do so to make this period more pleasant for the community. Until the first phase is completed, the venue will continue to host community events. For example, until the end of February, the local community can use an ice rink here, complete with skate rental and skating instructors. Later in the year, family, cultural and culinary programmes will be held here. 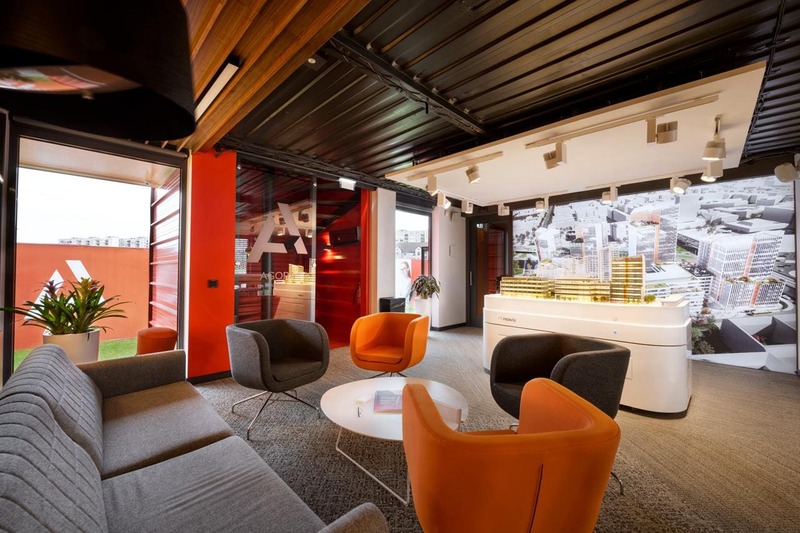 The Agora Budapest Showroom provides an insight into how HB Reavis and Agora Budapest, the project that has won the Planned Project of the Year – Commercial award, will revive the environment and make it more livable for residents, employees and the whole community of Budapest. The award-winning development, which is under construction at a busy junction of the Róbert Károly körút – Váci út office corridor, will be one of the most exciting building complexes in Budapest: it will be a multifunctional and modern city centre with unique, contemporary architectural solutions, as well as green areas and community spaces, adding to the beauty of the city and providing various services. This means that in addition to its sustainable and innovative solutions, Agora Budapest also captivated the jury with its community-building and environment-enhancing functions. 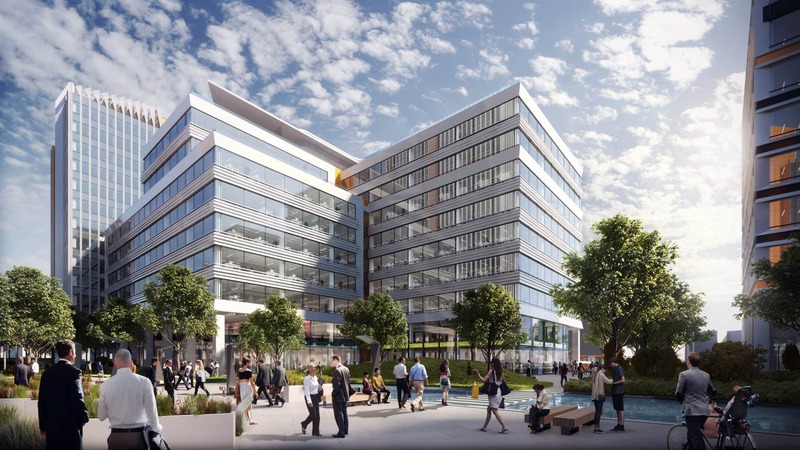 HubHub, HB Reavis’s co-working service will also be available in the building, which will have its own co-working office. Renowned foreign and Hungarian architectural firms have been working on the Agora project: London-based MAKE Architects, and the Hungarian Finta Stúdió, which has designed several iconic buildings. “It is a great honour to have received two major awards in the property market, and against such strong competition. We are thankful to our renowned architects, to District 13, the city of Budapest and every other operator and colleague who has contributed to the development of this part of the city. Currently the first phase of the development is under way, and in the spring the construction will enter a stage where it will be really spectacular,” said Jan Hübner, CEO of HB Reavis Hungary.